This has been my view of the world since last Thursday afternoon, but today, today, I graduated to dangling. 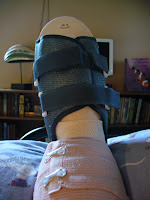 What this means is I can now alternate elevating and icing my foot with dangling and swinging it. Ahh, life's little pleasures. I do come away with a greater of appreciation of life winnowed down to one room, a bazillion pillows, good books and magazines, March Madness, a TV, a cell phone and the best gray dog ever. 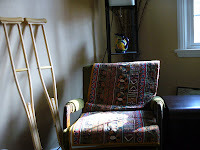 It's lovely watching spring slowly track its way across the TV room walls, creating long shadows and random sunspots. And it's lovely having the time -- and excuse -- to just sit. After his morning walk, Ben hopped up on the bed and settled in for the rest of the day, filling the room with quiet sighs and an occasional growl. 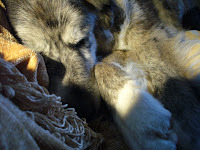 Finally, he burrowed his head in the chenille throw I had tossed over my lap as if to say, "I'll stay here forever if you will." I read a book cover to cover in just one day. (Haven't done that since college when, one Saturday, I was completely and totally paralyzed on my dorm room floor for 8 hours so, racing through "The Exorcist.") I watched a chick flick -- without apology. But I wasn't a complete lump. 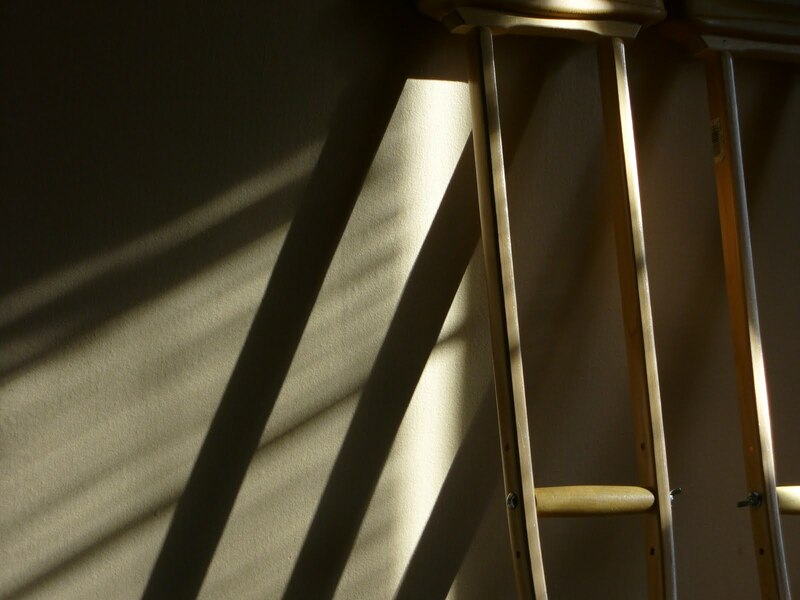 I did rise up out of bed and tool up and down the hall a few times each day -- just to say I did. And I did write thank-notes, to boot. See? I wasn't a COMPLETE lump. A few friends dropped by. Others texted and called on the phone. The WSP (aka, Wonderfully Patient Spouse) cruised in and out with ice packs and scratch tickets, hunkering down with me in the afternoon to watch our basketball brackets continue their inevitable march toward irrelevance as one upset piled on after another. Would I want to be confined to bed... or to one room... the rest of my life? The answer, of course, is no. But do I appreciate taking a step back now and then. 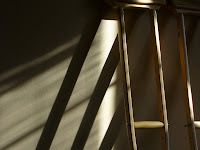 And I will savor the temporary solitude and simplicty that come with a few weeks' lost mobility. And all thanks, if you will, to the humble bunion.